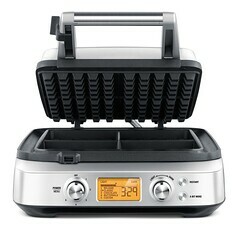 the Smart Waffle™ 4-Slice – - Good waffle batters start with sticky ingredients. How do you make crispy golden waffles without the mess? 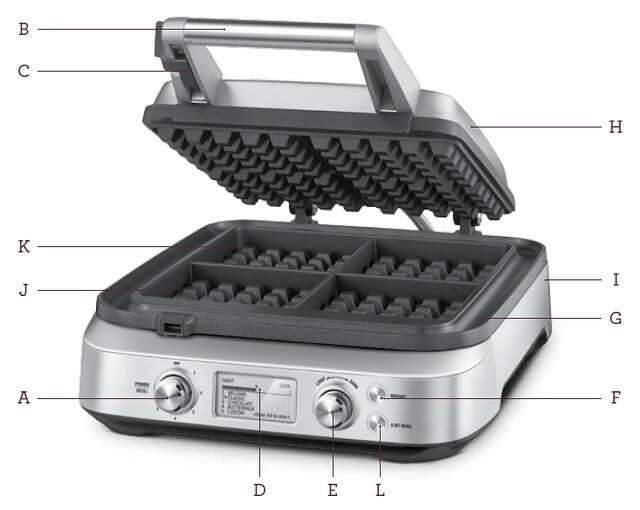 With Waffle IQ™ and an integrated moat, the Smart Waffle™ 4-Slice is simple to use and easy to clean up. A. POWER/MENU Dial. B. Top Plate Lid. C. Storage Locking Clip. D. LCD with Countdown Timer. E. Browning Control Dial. F. Restart Timer Button. G. Integrated Moat. H. Stainless Steel Housing. I. Breville Assist™ Plug. J. PFOA-Free Non-Stick. K. Die-Cast Aluminum Cooking Plates. L. A Bit More® Button.